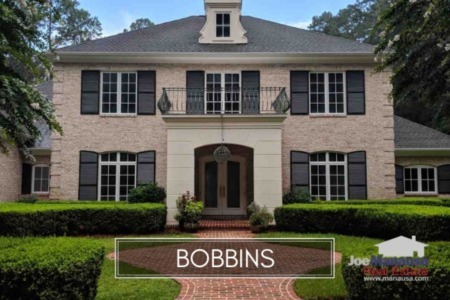 Located in Northeast Tallahassee just outside of I-10, the three "Bobbins" (Bobbin Brook, Bobbin Trace, and Bobbin Mill Woods) deliver some of the most expensive homes in Tallahassee. 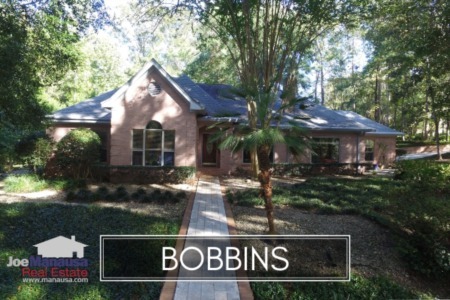 If you are looking for a luxury home, situated on more than an acre, the Bobbins are a good place to shop. 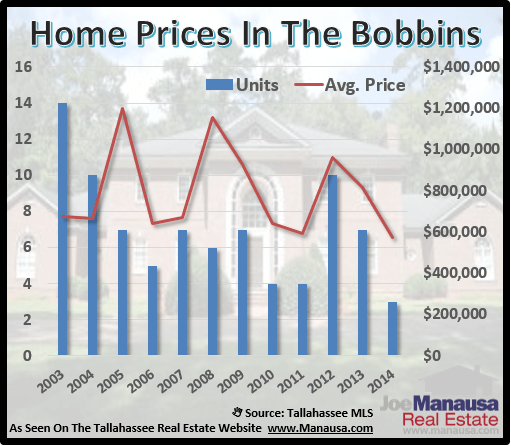 In this report, we will look at prices, values, and sizes of homes in the Bobbin neighborhood, as well as show current listings in the Tallahassee MLS and all closed home sales going back to 2003. For each of the 3 graphs found below, we have recorded the number of closed home sales for each year (blue columns, measured on the left vertical axis), and an important real estate statistic shown in red (measured on the right vertical axis. It is important to note that sales are through December for all previous years, but through mid October in 2014. Home prices have fallen again this year and current sales would have 2014 represent the lowest average home sales price on record. The average recorded sales price is $572,600 for Bobbin Brook, Bobbin Trace, and Bobbin Mills Woods thus far in 2014, and only 3 homes have sold. The pace of home sales, while lower than the previous two years, is consistent (or perhaps one sale lower) than what we have seen since 2005. Remember, low interest rates have made these homes affordable to many more people than what we expect to see when rates return to "normal" levels. Average home values in the Bobbins have fallen this year, bar are still far higher than the record low set in 2011. 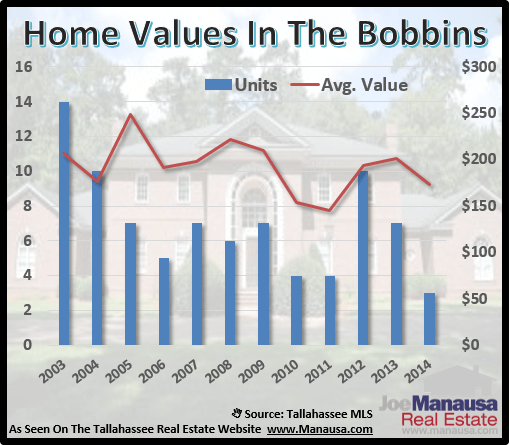 Home values are fairly volatile in the Bobbins due to the few number of sales each year, so this decline is not necessarily indicative of a trend change. Through mid October, the average value of a home sold in the Bobbins this year has been $173 per square foot. The number of homes at this end of the housing market in Tallahassee is still over-supplied, and I expect it to get much worse if interest rates were to rise above the 7% level. 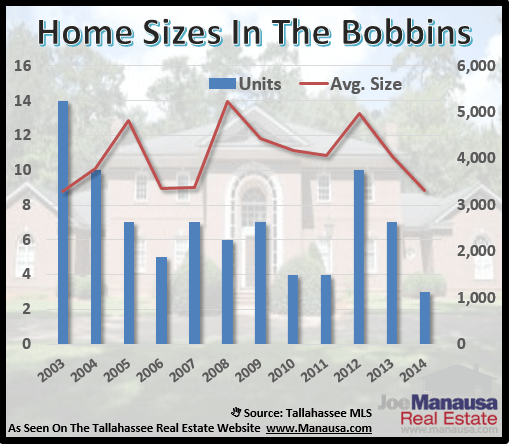 The average home size sold in the Bobbins typically falls in a range of 3,000 to 5,000 square feet, and this year the smaller homes are selling. The 3 sales thus far in 2014 have averaged 3,313 square feet, the lowest average recorded in the past 11 years. This might be indicative of buyers using low interest rates to "buy up" and get into these prestigious neighborhoods at the lowest possible price. The following list shows home sales going back to 2002 in the Bobbins. I hope you enjoyed our October 2014 update on home sales in Bobbin Brook, Bobbin Trace, and Bobbin Mills Woods, please feel free to drop me a note if you have questions not covered in this report.